The facelifted 2019 Ford Endeavour SUV is slated to launch in India by the third week of February. The dealerships across India have started accepting bookings for the updated Endeavour at a token amount of Rs 50,000. 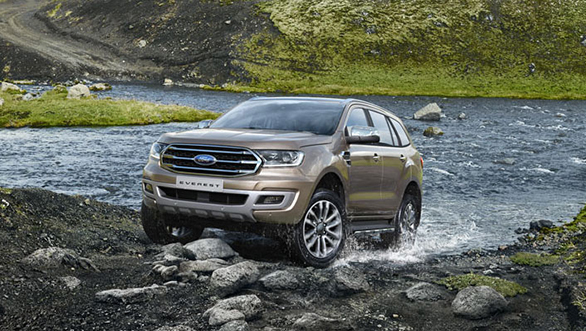 The new Ford Endeavour was launched globally in 2018, with cosmetic changes and a new drive train. The upcoming SUV is expected to sport a revised exterior with a restyled grille and more aggressively styled bumpers. The 2019 Ford Endeavour could be offered with a choice of new colour schemes too. The updated Endeavour is also likely to get a new set of redesigned 20-inch alloy wheels as a part of the update. Inside the cabin, the dashboard is expected to be refreshed and the infotainment system will run with the recent version of the Ford's Sync 3 system. Currently, the Endeavour is available with two diesel engine options - a 2.2l/160PS/385Nm for the base models and a 3.2l/200PS/470Nm unit that is only available in the range-topping trims. The 2.2l variant is available with a rear-wheel-drive layout only whereas the 3.2l engine option is offered with a four-wheel-drive drivetrain. Both the engines are available with a six-speed automatic transmission. We expect these powertrain options to remain unchanged in the updated model. While the prices for the new 2019 Ford Endeavour will only be revealed upon its launch later this month, we expect a hike of up to Rs 1 lakh over the outgoing car. Currently, the Ford Endeavour retails between Rs 26.82 lakh and Rs 33.31 lakh ex-showroom New Delhi, which makes it one of the most value for money offerings in its segment. Upon launch, the 2019 Ford Endeavour will face a new rival in the Mahindra Alturas G4, apart from its archrival, the Toyota Fortuner.